We have lots of extra Halloween foam stickers, so we decided to use some of them to make a spooky house. Materials Needed: foam Halloween stickers, glue stick, construction paper (we used dark purple, brown, and orange), scissors, and a marker. 1. We started off by looking online for pictures of spooky houses. My son liked one like this the best... so I tried my best to draw it. 2. Next I cut it out and cut out the windows. 3. I also cut a strip for the ground. My son added glue to the strip and stuck it to the bottom of the page. 4. Then he glued the spooky house and stuck it on. Not only was our house spooky, but we also talked about how it is a crooked house! He loved the angle that he put the house at. 5. Trace your child's hand to make a spooky tree. 6. Cut it out and glue it on. 7. Add foam stickers! We had several textured leaves, so we added them to our spooky tree. My son loved how soft and fuzzy they were. This is a perfect project for when you don't have too much time, but want to do something festive and fun. 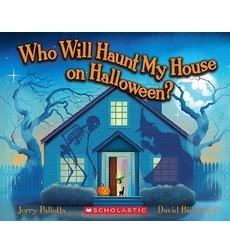 Check out Who Will Haunt My House on Halloween by Jerry Pallotta and David Biedrzycki if you want to read a fun haunted house story! such a great idea. I love the hand tree!